Agree! What is this sculpture meant for? I have a pair of pink patent leather platforms that I picked up a while ago since they were ridiculous and cheap! Now they would be considered conservative! Hahaha! Dude. I ran into this aisle and I had no idea what the citizens were wearing … and yeah I don’t know if your pink platforms would make it to the club. ha ha. 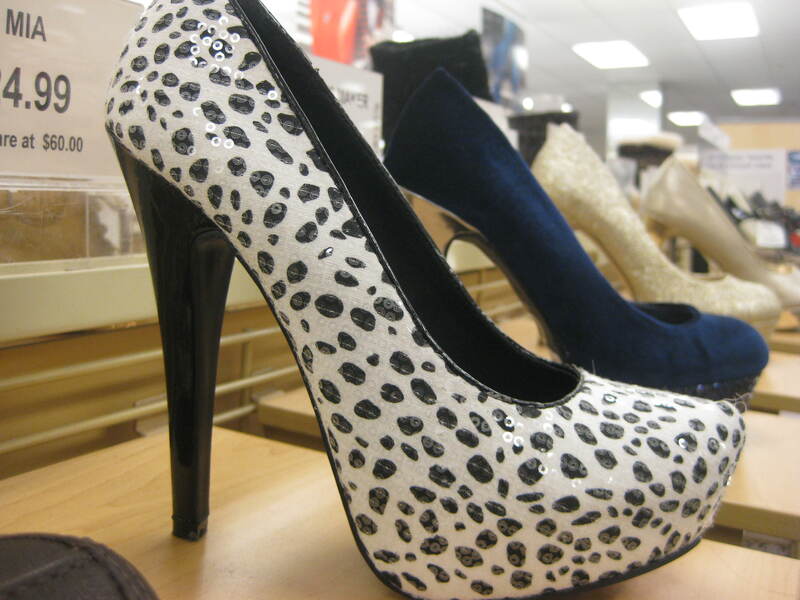 I seriously doubt that my foot could even fit in these, and in truth I have to practice walking in pumps. I am so not a high-heel chick. Once again, you made me smile. Your sense of humor just comes with the right dose of tickling punches. When I got with my wife for shopping, being the women’s section feels foreign. Imagine my uneasiness when in a Victoria’s Secret store with her . But husbands need to support their wife right? Ha. This made me laugh. So true. Ha ha. Glad it cracked you up. True stories are funny that way. 🙂 Thanks for stopping by.